If you are a fan of Bruce’s work or of men’s adventure magazines in general, this book is an absolute must-have. Bruce Minney is one of the top illustration artists who worked for the post-WWI men's pulp adventure magazines published in the 1950s, 1960s and 1970s. Tom Ziegler's book is a visual feast, full of hundreds of Minney covers and interior illustrations from the best of the men’s pulp mags. It also includes photos of original Minney paintings that now reside in the Rich Oberg Collection, plus previously unpublished photos of Bruce and the models he used. But it’s more than “just” an awesome collection of images. 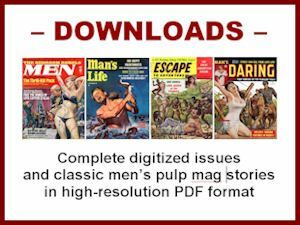 The text provides fascinating details about how Bruce approached different illustration assignments, about men's adventure magazines and about other top illustration artists who worked for them. It’s an amazing treasure trove of illustration art history and trivia. This post is the first of three guest posts by Tom Ziegler about his new book and Bruce. They provide a small inkling of what you’ll find inside BRUCE MINNEY: THE MAN WHO PAINTED EVERYTHING — a truly terrific book that I give my highest recommendation. I first met Bruce Minney in 1969. His daughter, Carole, and I attended Juniata College in Pennsylvania and we met the second week of our freshmen year. She took me home to meet the family that October. I remember Bruce had a little carved statue of a hand with the middle finger extended in his studio. He was not like most of the parents I met in the late 60s. Carole and I were married in 1973. In 2011, on a lark, Carole googled “Bruce Minney” just to see what was out there about him. There were over 4,000 results. Intrigued, she started to click through. She found a few auction results of sales of his work and a brief bio. 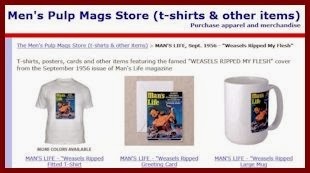 She also found The Men’s Adventure Magazines Blog. I started reading the blog from beginning to end. It was fascinating reading. In one post, there was a discussion about whether Bruce painted the cover for the June 1971 issue of MAN’S STORY. I showed it to Bruce and he remembered painting it. I emailed the blog’s editor, Bob Deis, and told him that Bruce was still alive and painting and that the piece in question was his. Within hours, Bob replied to my email and asked if Bruce would agree to be interviewed over the phone about his career and work. Bruce agreed. 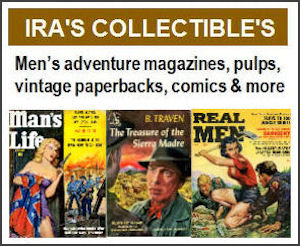 It also was our introduction to collector extraordinaire, Rich Oberg, and the book about his collection, MEN’S ADVENTURE MAGAZINES, by Max Allan Collins, George Hagenauer and Steven Heller. I emailed Bob and Rich telling them which illustrations in the books were Bruce’s. Soon, we were emailing each other with questions and comments. Bruce identified more of his work. The enthusiasm was contagious. 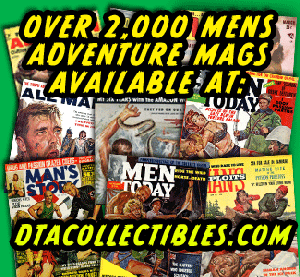 And then it dawned on me: Bruce painted hundreds of men’s adventure magazine illustrations and no one knew who he was. That’s when I decided to write a book about the men’s adventure illustration mystery man. But where to start? First, I wrote a Wikipedia article about Bruce. It got his name out there. Then the research began. Trying to identify Bruce’s work 40 years after the fact was a challenge. The originals were long gone. We started with a few folders of illustrations that Bruce had torn out of the magazines when he was picking up or dropping off a job. We also had photographs of four originals that were sold at auction in 2005. Covers were easier to identify because they had dates and titles. For the interiors, all we had were pages torn from unknown magazines. Sometimes there were article titles. Sometimes not. Without the internet, we would have been unable to identify as much as we did. We looked on eBay and did a lot of googling. We started out with a folder of about 75 interiors and have now identified over 500 original interior illustrations. 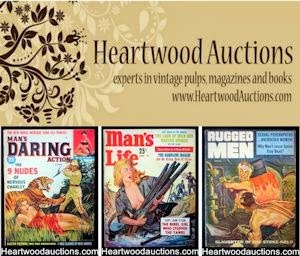 Thanks to collector, Rich Oberg, we didn’t have to spend a fortune on old magazines that originally sold for 35 cents and now sell on eBay for $20 or more. Bruce Minney was born in Oakland California October 2, 1928, the son of Amy and Howard Minney. Howard survived the depression delivering the San Francisco Chronicle from his 1925 Model T.
While in high school, Bruce assisted his father with the paper route and saved his money so he could attend college. After graduating from high school in 1946, Bruce applied to the California College of Arts and Crafts in Oakland, which later became the California College of the Arts. For four years, Bruce spent the morning drawing and the afternoon painting preparing for a career in art. Recently married to his high school sweetheart, Doris Schulz, and with a child on the way, Bruce made a choice that shaped his future. In his senior year, he took a class in advertising art. In 1951, Bruce's daughter, Carole, was born. To support his young family, Bruce got a job with United Airlines as a baggage handler. He was one of those guys you see on the runway with the orange batons directing traffic. At night, he worked on samples for his portfolio. He had hopes of becoming an illustrator for a top notch magazine. After an unsuccessful trip to New York looking for illustration work, Bruce quit the airline and got a job as a fireman in Orinda. The great thing about being a fireman was that you worked two 24-hour days and than had two days off. This schedule allowed Bruce to spend more time on his samples and come up with a plan. His plan was soon clear. He decided to move with his young family to New York, which at the time was the center for commercial art.